The Atlantis hotel him has to all, what takes in order to it keeps entertained us satisfied. It is a residence deluxe with a most excellent service, a big number of modern installations and a unique atmosphere. The Atlantis has a favourable place, right in the centre of city Heraclio, which is near in the palace Knossos, the archaeological museum, the fortress and other views of view, which attract usually the curious tourists. The lobby, shops, the restaurant "Ariadne", "Odeon" restaurant, barrier, high school, centre of faculty, internal swimming-pool, swimming-pool, exchange of currency, cellar of wine with a rich collection of international wines, air-conditioning instrument, meeting of babies, barber, safe, hairdresser of individuals of/ladies, redcap/hop of bells, operational centre, installations of conferences, secretarial services, photocopying service, rent of cars, space of quartering, concierge, installations for the with special needs individuals, public rooms, doctor, lifts, fax, cinemas-room pay per the opinion, the washing-machine and cleaning service, sauna. 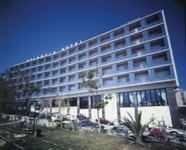 The hotel Atlantis includes beyond hundred fifty comfortable rooms with the refrigerator, the air conditioning, the mini-barrier, the satellite TV, radio, sure box and the bath with a telephone and hairdryer, wakeup call in the room, round a service of rooms of clocks, big verandas.